The roster for the Concordia men’s hockey team has many new names following training camp. In an effort to get some fresh legs into the program, head coach Marc-Andre Element chose rookies in favour of long time Stinger veterans. With 14 new players, the Stingers are once again a “young team,” as former head coach Kevin Figsby often said last year. Among the many names gone from the team from last year are forwards Ben Dubois, Antoine Houde-Caron and Kyle Armstrong, and goaltender Alexandre St. Arnaud. Houde-Caron, who would have entered his fifth year in university hockey and his second with the Stingers, admits he wasn’t sure about returning to the team during training camp. “I played for years at the university level and I thought that I played enough years in this league. This is the only reason why I did not come back,” said Houde-Caron. Armstrong attempted to play through training camp despite suffering from an injury to the anterior cruciate ligament, which connects the upper leg bone to this lower leg bone in his left knee. “I tried going back again this year, and it felt really unstable so I decided to get the surgery rather than risking re-injuring it,” Armstrong said. The Stingers have welcomed in some new blood to their squad in the absence of last year’s veterans, including forwards Frederick Roy—son of legendary Canadiens goaltender Patrick Roy—Charles-Eric Legare, Luca Ciampini and Anthony Cortese, as well as new defence players Andrew Rossy and David Hunter. “My final decision was to come here so I was really excited to be a part of this training camp with all the new guys,” said Legare, who scored his first goal with the team in their season opening game against the Ryerson Rams. He played in the Quebec Major Junior Hockey League last year. Rossy, who is from Montreal, went south of the border to play for the Plattsburgh Cardinals in the State University New York Athletic Conference. Another success story from training camp is goaltender Miguel Sullivan, who impressed coaches enough to land the starting position in games. The newcomer already has two wins for Concordia. “There’s an adjustment period for any kid that’s been playing junior hockey. It’s a lot stronger and faster,” said Sullivan. Sullivan will continue to share duties with Robin Billingham as starting goaltender. “I just go off of what the coach tells me. If I’m playing tonight I go in the net and I play,” Sullivan said. “It’s nothing against [Billingham] he’s a very good goaltender, he’s been here a long time and he’s got a lot of experience. “It’s not me against him, we’re a team here, we’re both trying to win games and bring the team as far as we can,” he added. Both players deserve the starting spot, and both are going to have to prove themselves as the best goalie for the team, said Element. Four players on the Stingers are coming directly from Quebec’s AAA hockey league as opposed to the Quebec junior league, including Hunter, Antoine Masson, Marc-Olivier Groleau, and defence player Julien Leduc. “The guys that we got in the AAA [league] are the top [players],” said Element adding that other CIS teams were trying to get those players as well. The coach is happy with the current mix of rookies and leaders on the team. The new players will get to brush shoulders with returning veterans, and experienced players including team captain Olivier Hinse, a Dr. Randy Gregg Award winner for excellence in his sport and personal life. “[The veterans] show a good example on the ice and off the ice,” said Legare. 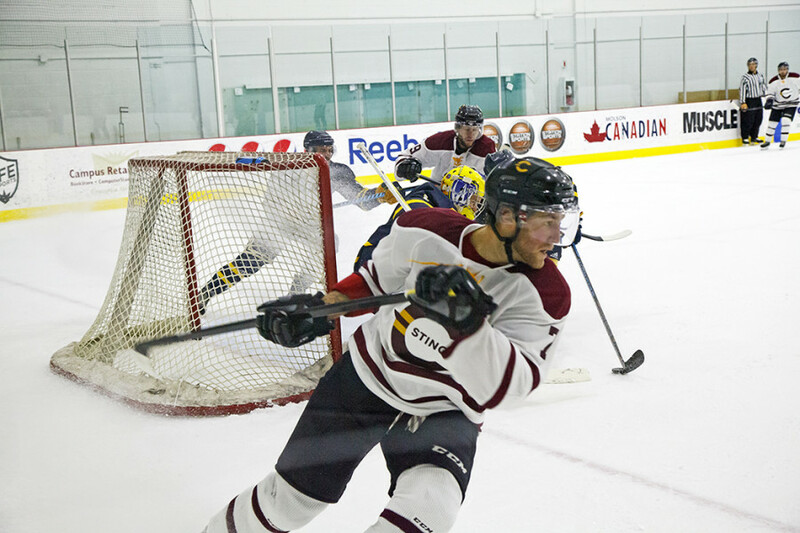 With the season already underway, the Stingers already have two wins and two losses. Element is hoping for progression on his team to make a better program.